We wanted to reach out to everyone and say hello! It is crazy to think we are already a week into summer. Here at Wooden Horse Corp Headquarters things are busy and bustling. Our building queue is filling up but we are happily taking on more orders! Thinking longer term - It is never too early to get your order in for a fall birthday surprise or Christmas present (hint, hint)! Even though none of us want to think about it, we will be in the fall months before we know it. We would like to make sure everyone is following along with us on our blog and social media accounts. Our content revolves around our customers so please feel free to provide feedback on what you are interested in. We also welcome and encourage your own submissions whether they be pictures, anecdotes, blog posts, exercise suggestions, or video clips! We love it all! As we get back to working on incoming orders, it is our hope that you have a safe and enjoyable summer. Ride often, laugh much, and make memories. We hope to "see you" on social media enjoying your Equicizer! 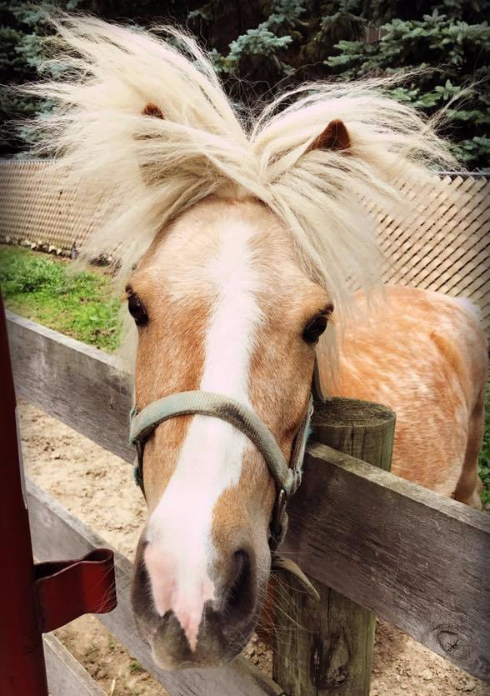 Kayla captured Popcorn the Pony (who lives next to the Wooden Horse Corp office) having quite an eccentric hair day! He is such a character! Our latest Wooden Horse Wednesday blog features an Equicizer named Woody who resides at the Dream Catcher of L.A. Therapeutic Riding Center. Email us if you would like to write a blog about your experiences or have your Equicizer featured on our blog!